The Nokia Lumia 930 is a svelte Windows Phone handset with NFC. The 930 features a 5-inch full HD display, 20MP pureview camera, surround sound recording and built-in wireless charging. 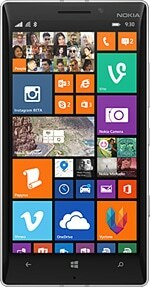 The device is almost identical to the Verizon-only Nokia Lumia Icon introduced in February, with the addition of global LTE support. Three other Windows Phone handsets also launched in early April 2014 — the Nokia 630, Nokia 640 Dual SIM, and Nokia 635 — don’t offer NFC.